Both Ilios and Selene are enchanting finds for those who appreciate design combined with stylish simplicity. This smooth - edged architecturally restored "Canava" or cave house Santorini holiday villa is traditional in both Imerovigli villas and Greek island villas, in essence. White washed walls are set against the geometric patterns of the surrounding sun cracked earth. Stylish and Mediterranean in feel, sensuality abounds through the cooling, exquisite interiors of this Santorini holiday villa which acts as more of a silent retreat than a Santorini vacation villa. Classified as a traditional Santorini "yposkafa" dwelling, this Greek islands villa provides sumptuous, yet luxuriously simple accommodation in its two separate living areas. Perfect for a romantic get - away or a holiday with a small group of friends, this vacation villa in Santorini provides the perfect holiday villa in Greece from which to explore the tourist attractions of Santorini, whilst enjoying the ultimate haven in peace, authenticity and tranquility. 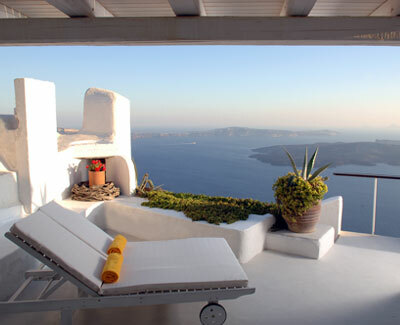 The house is also rented as a whole as a holiday villa in Greece, in order to offer our guests ultimate privacy. The two living areas are divided as follows for private parties no larger than two persons. Expansive accommodation is present in both Ilios and Selene, different shades of white offset by handpicked pieces of furniture, strong simple lines abound throughout awash with the fascinating plays on light that seep through every window and door. Ilios consists of a beautiful, compact, modern kitchenette and breakfast area. Glass doors lead out onto the beautiful shaded terrace, opening out to the never ending views of the Caldera and the Aegean Sea. A curved stairway leads down to a comfortable white washed luxurious double room with small en - suite bathroom with open shower. Selene is fronted by glass double doors leading into the open - plan dining and living area, affording a wonderful entertainment area for invited guests, simple, yet luxurious in clean cut shades of white. A well equipped galley style kitchen boasts a view of the famous Caldera. The all - white master bedroom leads to an elegant dressing room and en - suite bathroom with shower. On the lower veranda of Selene, guests can indulge in the comfort and luxury of the outdoor Jacuzzi ideal for two persons.